Look to view the keys and padlocks in a secure lock box that is shaped to say STOP! ACCUFORM SIGNS STOPOUT Look 'n Stop Group Lock Box safely and securely stores keys from lockout. Four rows of aluminum strips contain 16 hooks to hang keys. Once closed, holes and slots along the edges of box and cover align, and can be secured with up to 44 padlocks (sold separately). Each padlock represents a worker on the lockout project. Each padlock removed signifies the worker has completed their portion of the project. Yet there is no access to the keys of the locked-out devices until the last padlock is removed. The 13" x 13" x 3-1/2" box is made of durable, impact-resistant plastic, and is designed for industrial environments. 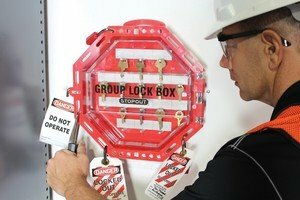 The Look 'n Stop Group Lock Box includes a top carry handle for portability, two rear keyholes for wall mounting, and a flange foot to set down on flat surfaces. ACCUFORM SIGNS manufactures visual communications systems for facilities and the workplace. Our products include almost every type of safety sign, tag, and label, as well as an extensive line of Lockout/Tagout products. Accuform is widely considered the leading facility safety identification manufacturer in North America and beyond. For nearly 40 years, ACCUFORM SIGNS, headquartered in Brooksville, Florida, has continuously perfected and improved sign, tag and label manufacturing processes, safety procedures, environmental compliance, and distribution strategies to deliver world-class visual communications to the workplace that protect, inform, and motivate the global workforce. If you have any questions about this product by Accuform, contact us by completing and submitting the form below. If you are looking for a specif part number, please include it with your message. Brady USA 65329 Red Impact Modified Glass Filled Nylon And Polypropylene Oversized Breaker Lockout, English, 15.34 fl. oz., Plastic, 1" x 1" x 2.25"